The Confucius temple is located in central Tainan in a walled compound with a small park in which also a school and the former Japanese Martial Arts Hall are sited. The temple was built in 1665 by Cheng Ching, son of Koxinga as a centre of Confucian studies. The entrance to the temple is free, although a small fee is charged for the central palace area. The temple is relatively void of decorations, as it is not used as a centre of worship. 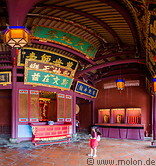 The Confucius temple is one of the major tourist attractions of Tainan.